I found half a laundry basket of scraps under a table in the sewing room. I knew they multiplied in the night. As I looked at the scraps I decided they have been there about a year. 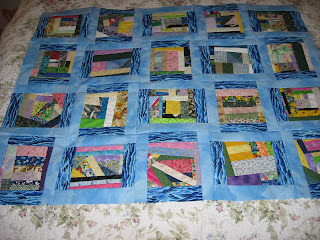 The blocks in the above quilt are sometimes called Mile a Minute or Crumbs and Chaos. In fact, I found a tutorial on how to make them. I trim my blocks to 6 1/2" squares. I've made tote bags, table runners and table toppers from these blocks. Today this quilter has to leave her sewing machine and drive to Owego for a historians meeting. I've been the Barker Town Historian since 1988. This is a fun job that enables me to meet people from around the country as they pass thru the town looking for its history or to find information on their ancestors. Last fall a couple from California were here. We met at Rogers Cemetery where the man visited the grave of his 2x great grandfather.